Bank guarantee fraud involves bogus investment schemes that promise you quick riches if you invest in a fund that buys bank guarantees issued by prime banks such as ING. The fraudsters will invite you to invest and will tell you that the bank guarantees will be bought at a discount and sold shortly afterwards at a huge profit. They will try to make the schemes appear legal and legitimate by showing you complex, sophisticated documents that appear to be official. They may tell you, falsely, that your investments will be secured by letters of credit, bank guarantees or other guaranteed certificates backed by the world’s major banks. They will claim that you will make high profits if you invest large sums in their schemes. As soon, however, as you part with your money, it will disappear – along with the investment company. 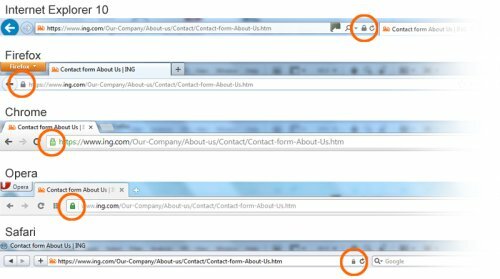 ING monitors the internet to find imitation websites and apps, which are often the first step made by phishers. We then work with the appropriate international authority to get the websites closed down and Apps taken out of the App stores as quickly as possible – sometimes on the same day we find the website or App. To report phishing attacks please send us an email. ING emails will never ask you to reply in an email with any personal information. ING will use state of the art encryption and authentication mechanisms to secure the transactions; these will vary per country so check with your local bank about the processes used. ING will never claim your account may be closed if you fail to confirm, verify, or authenticate your personal information via email. 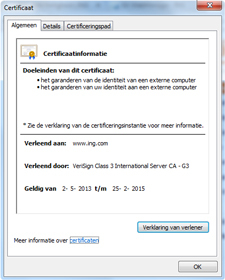 ING will never claim the need to confirm important information via email due to system upgrades. When you click on the icon with the padlock, then a security certificate should appear. The certificate shows who owns the website; it should show the name of your bank. Verify that the data and validity are correct. What can you do to protect yourself from fraudulent apps for smartphones? Just because an app is in an App Store doesn’t mean that it is a legitimate app. App store owners constantly remove fraudulent apps from the app stores, such as fake antivirus, browsers, and games. Cyber scammers also attempt to impersonate ING products. Scammers will try any means necessary to trick you into installing a fake app. Criminals use emails and SMS messages that appear to be from a trusted brand, e.g. ING, to trick you into downloading applications that will compromise your data. Sometimes fake apps will pose as security updates, and clicking on the links may also lead to your information being stolen. Only download apps from official sources. Before downloading any app, do some research. How many times the app has been downloaded? A wildly popular app is a telltale sign of a good app. Read app reviews, look at the developer, and do a search online. If you receive an unexpected SMS, a strange alert or notification, or unusual requests from ING or other familiar brand, beware: criminals may be trying to install a fraudulent app. Use caution with any link delivered to you and always read the message first. Instead of using the link supplied in the message, go directly to the website or app-store you normally use and log into your account the way you would normally do. Never respond to a spam message, your emailaddress is then recorded as live and the spam will increase. At ING, the safety of internet banking and the continuity of our online services are our top priorities. Our specialists work day and night to optimise our systems and processes. Despite the effort we put into the security of our systems, vulnerabilities can still be present. Do you have the skills and have you discovered any vulnerabilities in our systems? Please help by reporting these vulnerabilities to us, so that we can improve the safety and reliability of our systems together. A team of security experts will investigate your finding/findings. You will receive an e-mail with an initial reply within two working days. However, there may be a delay in responding due to workload or holidays. Please note: going public with your finding before we have fixed it will exclude you from the “reward”. Instead, please talk to our experts and give them time to assess and solve the problem. Responsible Disclosure regulations may differ by country. We strongly advise you to take these regulations into account. Your investigation of our IT systems could be regarded as criminal under local or international law and you may then risk criminal prosecution.. If you have detected vulnerabilities in one of our ING pages, please be aware that local law takes precedence over ING rules. Nevertheless, if you act in good faith and according to ING’s rules, we will not report your actions to the authorities, unless required to do so by law. We will only use your personal information to get in contact with you and to undertake actions with regard to your reported vulnerability. We will not distribute your personal information to third parties without your permission, unless we are required to do so by law, or if an external organisation takes over the investigation of your reported vulnerability. In that case, we will make sure that the relevant authority treats your personal information confidentially. To encourage reporting vulnerabilities to ING, we would urge you to send any vulnerabilities you detect to us. As mentioned, you may receive a reward. The amount of the reward depends on the severity of the vulnerability reported, the type of website (static information sites versus online banking sites) concerned and the quality of the report we receive. If the report is of great value for the continuity and reliability of the bank, the reward will be considerably higher. Rewards will be declined if we find evidence of abuse.